With five different tickets “live” and thus eligible to produce a life-changing score in Santa Anita's Single Ticket Pick 6 Jackpot – including one that singled 5-2 post time favorite Red Shelby – it was Gone to Town, an 8-1 shot trained by Hector Palma and ridden by Alonso Quinonez, that sailed home in Monday's nightcap at the Arcadia, Calif., track to win by four lengths, resulting in one lucky winning ticket worth $466,919.40. Purchased for $2,880 at the Hollywood Park Casino in Inglewood, Calif., the winner's purchase contributed to a total Pick 6 pool on Monday of $524,462. With a special nine-race card on Martin Luther King Day, Monday's Pick 6 got off to a rocky start with Trickonomics winning the fourth race by a half length under Kyle Frey. Off at 38-1, he paid $79.00 to win. Form prevailed in race five, as Afleet Ascent, ridden by Rafael Bejarano, connected by 1 ½ lengths as the 9-5 favorite and paid $5.80 to win. Monday's sixth race was no stunner either, as 2-1 second choice Jimmythisnjimthat, with Tyler Baze up, won by three quarters of a length and paid $6.80 to win. The Grade III, $100,000 Megahertz Stakes served as the seventh race and it was taken by the second choice in the wagering, Madame Stripes, who was off at 7-2 with Kent Desormeaux and paid $9.00 to win. Monday's eighth race went to the third choice in the straight wagering, Hot Sean, who at odds of 7-2, won by three quarters of a length with Joe Talamo up and paid $9.20 to win. 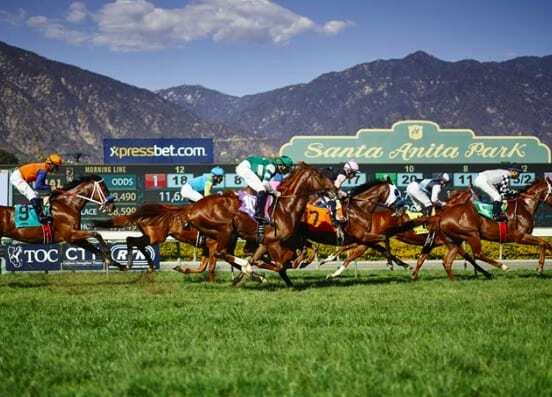 Live racing resumes with an eight-race card on Friday at Santa Anita. First post time is at 1 p.m. and admission gates open at 11 a.m.
Santa Anita will be open for simulcast wagering on both Wednesday and Thursday. Admission and parking are free and admission gates open at 10 a.m. This entry was posted in Horseplayers and tagged alonso quinonez, horseplayer, megahertz stakes, pick six, pick six carryover, rafael bejarano, santa anita, santa anita park, Santa Anita Single Ticket Pick 6 Jackpot, score by Mike Willman/Santa Anita. Bookmark the permalink.